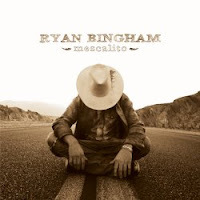 Mescalito is Ryan Bingham’s major label debut. The first thing that sticks out is his voice. He sings with a whiskey soaked, world weariness that fits in well with the southwestern themed music he’s making. There are a couple of spots where his vocals bring Tom Waits to mind. Musically there are a hodgepodge of influences that come through. Certainly Joe Ely and Robert Earl Keen are amongst the hints I pick up. I was also reminded of Chris Whitley’s brilliant debut when I listened to Mescalito for the first time. Ryan Bingham takes all those influences and adds his talent to the mix. In doing so he has come up with a sound that is simultaneously pleasingly familiar, yet somehow new and fresh. On again, off again guitarist for the Black Crowes, Marc Ford produced the album. He did a fine job as the music shines through and isn’t bogged down with any unnecessary elements. The clean production helps Bingham’s voice and music mesh together. “Bread and Water” seems to skip along to a handclap beat, while guitar and banjo sizzle just below the surface. One of the other highlights “Don’t Wait For Me” features a gentle and elegant slide guitar that never overpowers his impassioned vocal. However, my absolute favorite track on the album is “Ghost of Travellin’ Jones.” It’s a song I could see Widespread Panic playing. In fact Bingham’s delivery (more than his voice) on this one puts me in a mind of John Bell, Panic’s leader. It chugs along with a passionate intensity that stuck in my head after the first listen. Repeated listens underscore it’s impact. I haven’t seen Ryan Bingham live, but the songs on Mescalito sound like they were made to be played to an audience. All fourteen tracks sound real and have a terrific rawness to them. Mescalito really breathes. It’s one of the best new albums it was my pleasure to hear this year. I look forward to seeing live him when he hits my area.